Gaetano Donizetti’s Roberto Devereux will be the second offering in the 2018–19 season of the San Francisco Opera (SFO). It’s first performance will be given on Saturday, September 8, the night after the gala opening of the season with the double bill of Pietro Mascagni’s “Cavalleria Rusticana" and Ruggero Leoncavallo’s “Pagliacci.” This past Friday SFO announced a change in the casting. Baritone Artur Ruciński will be unable to perform the role of the Duke of Nottingham due to lung injuries sustained in a serious bicycling accident involving a car in his native Poland. He is expected to make a full recovery, but that recovery will require an interruption of his performance commitments. Ruciński will be replaced by Romanian-American baritone Andrew G. Manea, who is currently in his second year as an Adler Fellow. He made his company debut in 2017 as Marullo in Giuseppe Verdi’s Rigoletto, and last season he performed the role of the Marquis d’Obigny in Verdi’s La Traviata. 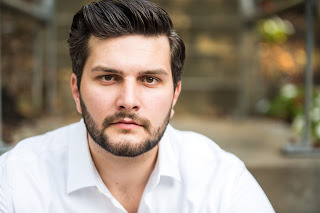 As a member of the 2016 Merola Opera Program, he gave a memorable performance in the dual role of Iron Hans and the Wolf in Conrad Susa’s Transformations opera, based on poems by Anne Sexton. Nottingham will be Manea’s role debut. He will join an all-star cast featuring soprano Sondra Radvanovsky as Elisabetta (Elizabeth I, Queen of England), tenor Russell Thomas in the title role (Robert, Earl of Essex), mezzo-soprano Jamie Barton as Sara, the Duchess of Nottingham, tenor Amitai Pati as Lord Cecil, and bass-baritone Christian Pursell as Walter Raleigh. Pursell will be making his SFO debut. The production of Roberto Devereux is being shared with the Canadian Opera Company with staging by Stephen Lawless. It was given its first performances in Toronto in 2014. Riccardo Frizza will conduct the SFO Orchestra and Chorus, the latter having been prepared by Chorus Director Ian Robertson. Roberto Devereux will be given a total of six performances, which will take place at 7:30 p.m. on September 8, 11, 14, 18, and 27 and at 2 p.m. on September 23. The libretto will be sung in Italian with English supertitles. The approximate running time will be two hours and 40 minutes with one intermission. The War Memorial Opera House is located at 301 Van Ness Avenue, on the northwest corner of Grove Street. Single tickets are priced from $37 to $398. Tickets may be purchased online through an event page on the SFO Web site. Tickets may also be purchased at the Box Office in the outer lobby of the Opera House. The Box Office may also be reached by telephoning 415-864-3330. Standing room tickets go on sale at 10 a.m. on the day of each performance. They are sold for $10, cash only.